Additional Notes: MALE: AmStaff mix, adult, chocolate coat with white blaze on chest, not wearing a collar. Found roaming on July 28/18. NOTE: This dog is now in the care of East Hants Animal Services. If you haven’t found his owners I might be interested! How long will you wait before finding another home? Very interested!! 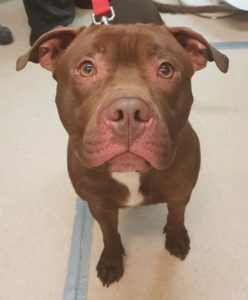 You will have to contact East Hants Animal Control and ask them about this dog as we only post a dogs info and have nothing to do with caring for or re-homing dogs. Thank you for your interest.